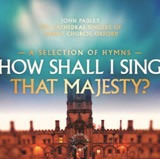 Our most recent recording, “How shall I sing that Majesty?”, was released on 20 July 2013. Order your copy here. How shall I sing that majesty?